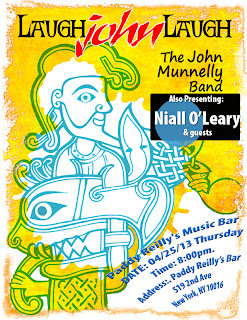 Special show with Niall O'Leary and supported by The Irish Business Organization of NYC bring you Niall O'Leary and John Munnelly. Eight til Late on Thursday April 25th. Niall will be joined by guest Martin O'Connell the current senior All-Ireland champion button-accordion player from Co. Kerry. John Munnelly is an ASCAP award winning songwriter for 'The Unemployment Blues' and known for the online youtube 'hilarious' video sensation - "Does my BUM look big in this?" and the critically acclaimed 'Happy Christmas' song on the recent Contemporary Celtic Christmas Collection from another IBO member PR/Producer Anita Daly. He is a musician/band leader of The LaughJohnLaugh Band and IBO member living in Brooklyn and originally from Cavan. Bio-furcation more questions to the answer who be do be do - ? Who he and Why Laugh? "LAUGHJOHNLAUGH"
John Munnelly is an ASCAP award winning songwriter for 'The Unemployment Blues' and known for the online youtube 'hilarious' video sensation - "Does my BUM look big in this?" and the 'Happy Christmas" song on the recent Contemporary Celtic Christmas Collection. He is a musician/band leader member of the IBO living in Brooklyn and originally from Cavan. He writes in a wide array of styles encompassing themes from the humorous to the serious. His material usually contains positive uplifting messages dealing with life and the human condition with unique wit and insight.